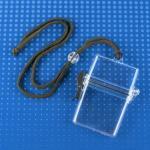 Badge holders are ideal to protect your badges and extend the lifespan of your cards. We stock a large selection of horizontal and vertical badges holders. Choose between flexible, semi-rigid and rigid badge holders depending on your application. 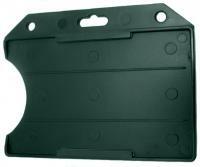 We also carry holders for technology cards such as magnetic cards and proximity cards. These holders help you display your badge while securing your data. Durable and affordable, our badges holders come in a variety of colors and styles. Find out now which badge holders are right for you. WHAT TYPES OF BADGE HOLDERS DO YOU OFFER? Badge holders are the go-to accessories to display your badges and attach them to your clothing or to a lanyard. No need to punch a hole in your cards! The first step to choose the right badge holder is to check the design of your cards. Badges in a portrait format will need vertical badge holders while landscape cards will require horizontal holders. If you are using magnetic or proximity cards, select badge holders specifically designed for this type of cards. These holders will protect your cards durably. We offer badge holders in different materials: clear and color vinyl, semi-rigid and rigid badge holders. Need help finding the right holders? Call us at 1-800-897-7024. Visit IDSecurityOnline's Resource Center! It is your one-stop destination to find clear information on everything ID.